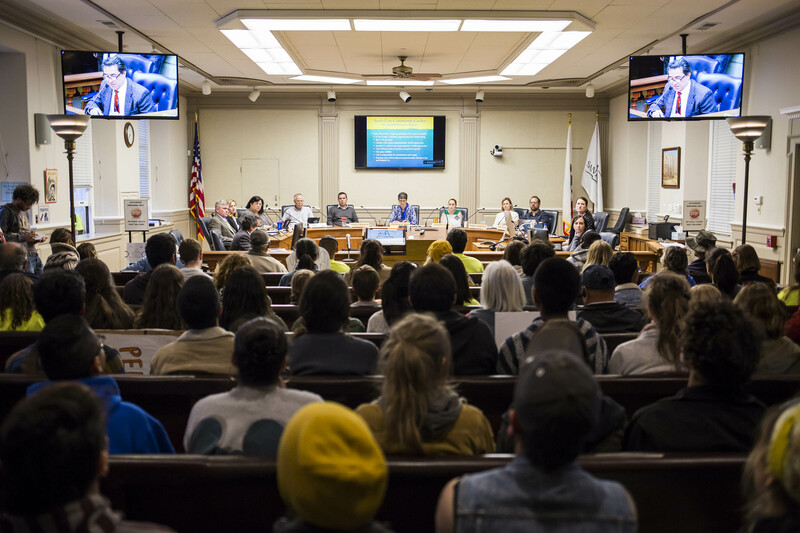 Santa Cruz City Council approved an agreement with Seaside Company for a new three-year lease on 16,000 square feet of the Beach Flats Community Garden at Tuesday night’s packed city council meeting. Seaside will reclaim 10,000 square feet for its own landscaping purposes. Over 100 protesters, including UC Santa Cruz students and community members, marched from the Beach Flats garden to Santa Cruz City Hall, where they filled the meeting to hear news of the night’s only agenda item — a six-month progress report on the October City Council resolution declaring intent to find the garden a permanent home. Over a dozen community members, including students, spoke during the public comment section of the meeting, which lasted an hour. The new lease will cost the city the previous nominal price of $1 annually. The city will pay taxes and water bills and be responsible for maintenance. Santa Cruz Parks and Recreation plans to install a wrought iron fence that the city and Seaside Company will share. Tensions ran high at the meeting after a miscommunication between the city and gardeners led to mature fruit trees and perennials being bulldozed on March 24, disregarding verbal agreements made between city officials and gardeners. 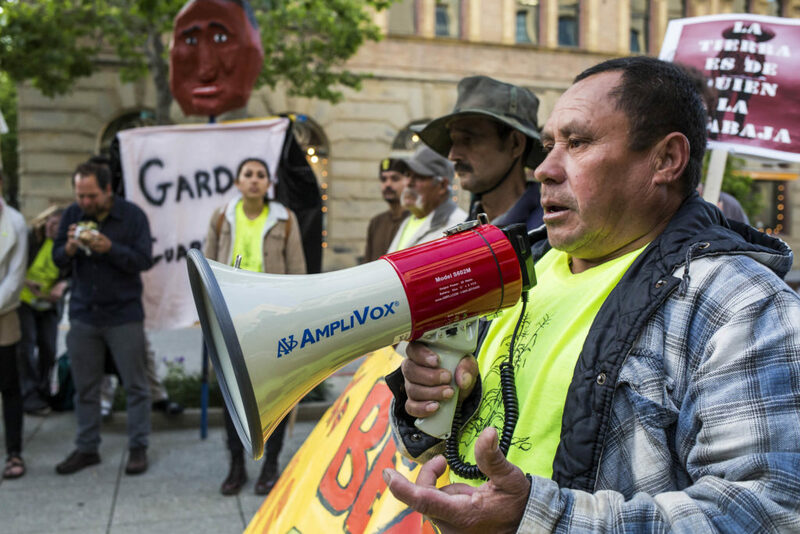 Gardener José Lucas Escobar speaks to a crowd of about 100 protesters on Pacific Avenue during the march. Photo by Jasper Lyons. Despite the newly-signed lease, Beach Flats garden community members continue to look for a permanent solution beyond the three years. One possible way forward would be to purchase the garden via eminent domain, which involves seizing the property from the Seaside Company for public use and compensating them with the fair market value. While the route of eminent domain was not chosen in the October meeting, Councilmember Micah Posner made a renewed suggestion at Tuesday’s meeting, directing staff to take action toward making an appraisal for the acquisition of the garden via either standard purchase or use of eminent domain. This view was not shared by all council members. Councilmember Pamela Comstock compared eminent domain to theft, after recounting a memory of having her bike stolen at 8 years old by a man who needed to get to work. The comparison drew boos from the public, which prompted Mathews to adjourn the meeting for a short time after expressing her disappointment at the way the meeting was being conducted. There were instances throughout the evening of verbal disagreement voiced by Beach Flats supporters toward the city council. Mathews had called for quiet several times before the adjournment. Beach Flats supporters also expressed dismay at a clause inserted into the lease which, in the event that a use permit was not granted to Seaside Company by the city, would grant them power to terminate the lease for the entire garden. The use permit would approve Seaside’s plans for “agricultural and landscaping purposes that support the boardwalk and surrounding properties that [Seaside] own,” Reyes said. “[It’s] really scary to me when it comes to trying to collaborate with peers, that Seaside tried to extort the city by putting something in the lease that says if we don’t give them the permit, then it’ll pull the plug on the garden,” Posner said.